I can honestly say I’m loving the juices. Apart from the wheatgrass shot (only once so far) and quite clearly is an acquired taste, I’m finding all the juices really delicious. No really! I’ve been surprised at how full I am on each day and wondered if I should reduce the quantity of fruit and veg I juice or even to skip one of the many daily juices. 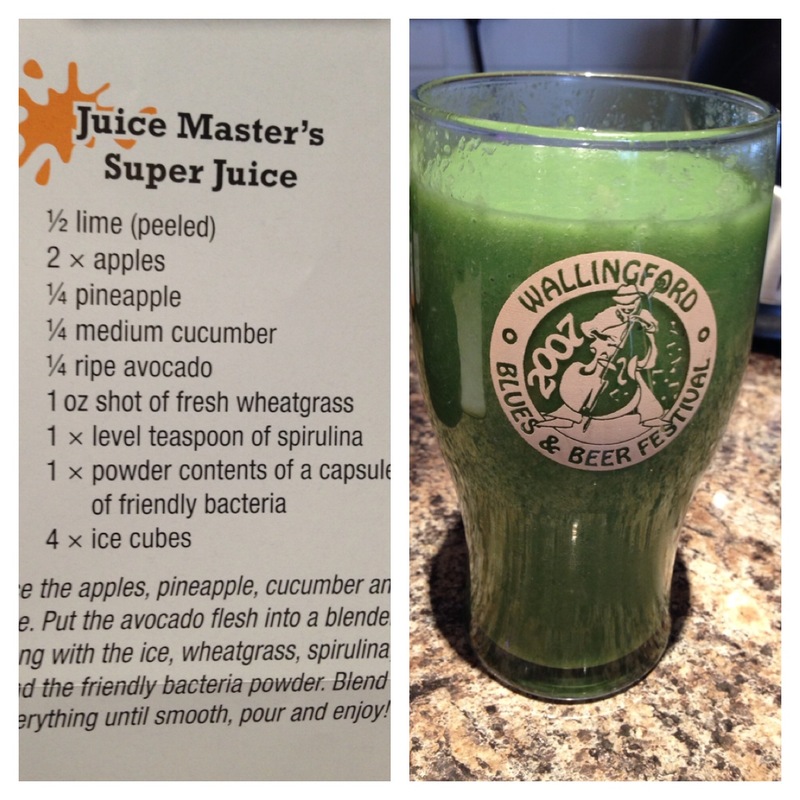 I called the ‘Juicemaster Hotline’ to ask and now understand even more about it. They suggested that if I was struggling with the volume then I should still do all the juices but reduce the content slightly. I hadn’t realised (blonde!) that each one is specifically chosen as it has certain ingredients and therefore benefits to be taken on that day and in that order. Make sense really but I’d not thought it through that far. I have read the book from cover to cover. This is recommended as it gives you many motivational tips and tricks as well as dealing with many of the myths associated with juicing. Certainly for me, many of the things in the book (and other material) have made sense. For instance, I thought I’d be craving certain things. Or perhaps needing to use my teeth and chew! In reality it’s been ‘relatively’ easy to a) remind myself it’s only 7 days; b) I chose to do this and not doing it is failing; c) no-one is watching, except me – but how would I feel; and d) Chew a piece of carrot! I also downloaded the App. This has been really useful as a reminder of what’s next and when + they have a great ‘shopping list’ feature that I know I’ll use when the 7 days is over but to continue juicing as ‘part’ of a healthier diet. It’s not cheap to start out with this juicing and I guess you’ve got to be sure you’re going to continue with it (on some level) before making investments. 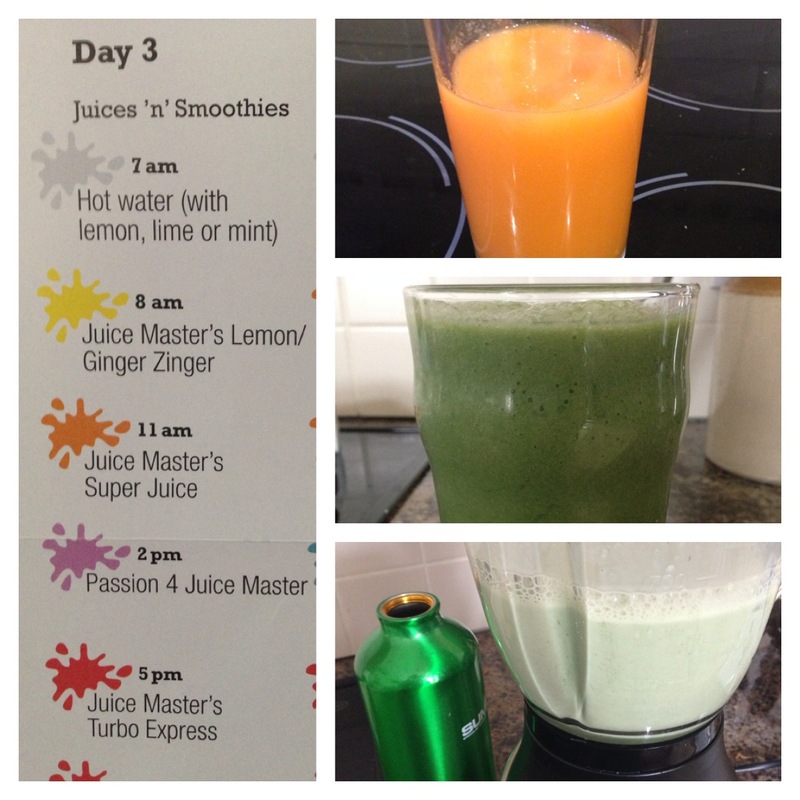 I did do Day 1 only with a blender (no juicer) which meant blending everything and then straining it each time. I took such a lot of time, I needed to spend more time chopping and preparing the fruit and veg and the washing up of the sieve wasn’t great! 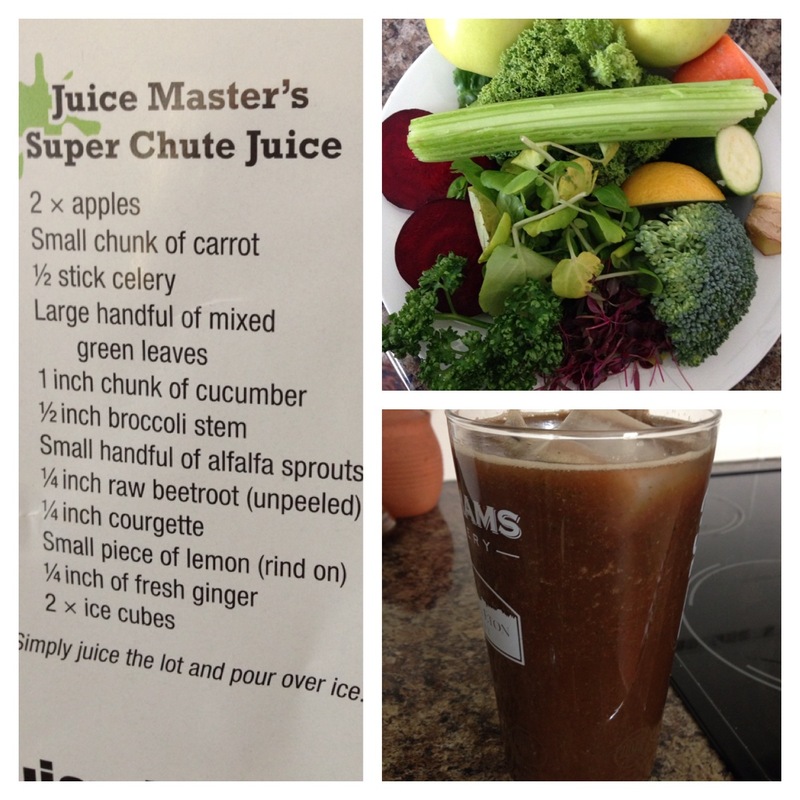 By the end of Day 1, I’d ordered a new juicer to be delivered on Day 2 before midday! It was under £100 (with express delivery) and is so worth it. Firstly it’s quick and easy to juice and secondly, the parts are easy to clean and can be put in the dishwasher too! On Saturday evening however I did have to ‘misbehave’ a little. For a very very long time, I’ve had a dinner in the diary, the menus had been chosen and I was committed to being there (as well as wanting to be there for my friend’s birthday). However although I made the decision that I would eat the dinner, I would only drink water and forego any G&Ts or wine with the meal. The dinner was delicious and I didn’t have a hangover on Sunday morning! Day 4 now. I’ve done a little weigh-in and there’s a little weight lost but not a lot. Although to be fair I wasn’t really expecting a great deal at this point as I’ve taken on board such a lot of liquid and juice, only a few days in and also had dinner on Saturday! So any loss was good. What I have noticed is that my skin is definitely clearer and brighter. I’ve also (don’t quite me on this) noticed that there’s a curve or two appearing on my body. I may not have lost much weight at this stage but there’s definitely a reshaping going on and my clothes are fitting more comfortably. Looking forward to the next few days and will update you then. 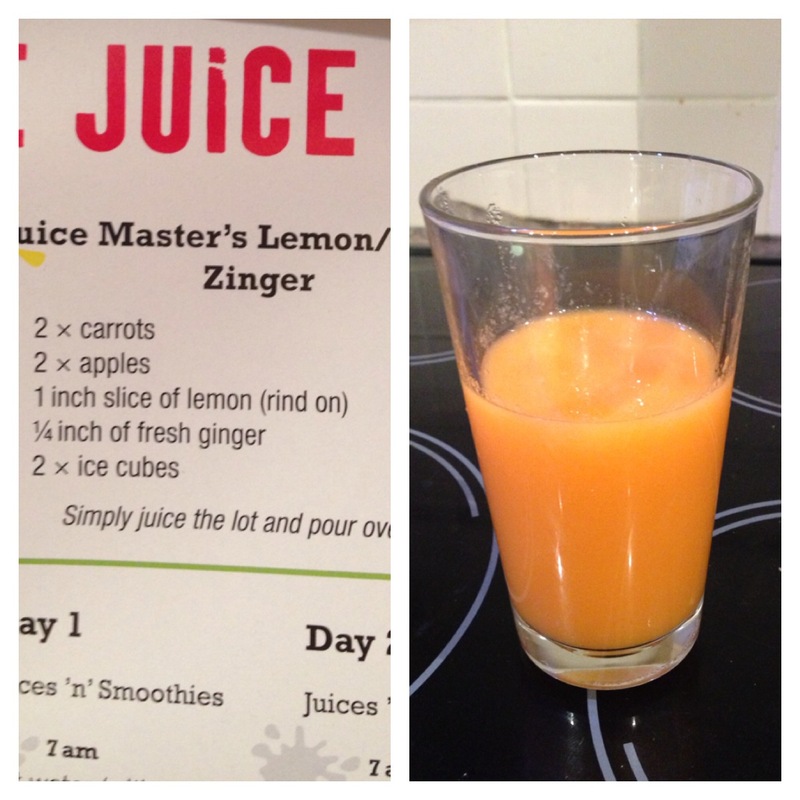 This entry was posted in Living, My health and tagged Juicing, Penny Brohn by AnnaGoAnna. Bookmark the permalink.